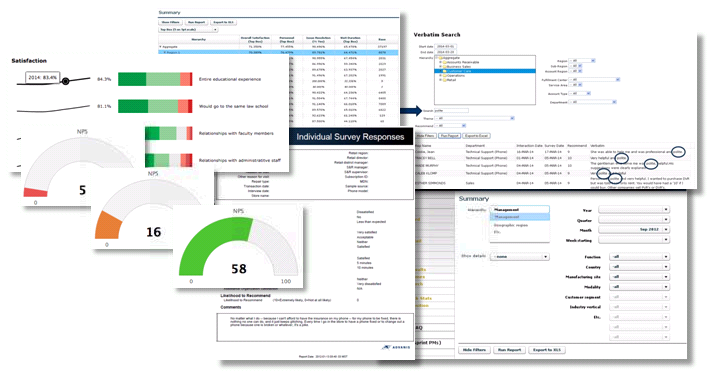 Advanis has developed an approach to customer experience measurement that provides actionable, near real-time, outcome-oriented satisfaction data down to the level of individual agents, typically for less than most companies are already spending on their current higher-level customer satisfaction programs. We design and implement entirely new customer satisfaction programs from scratch or work within existing programs to deliver performance efficiencies, cost reductions, and more actionable results. Tactical: Call c enter and local managers are able to use the data as the basis for immediate performance intervention, coaching, remedial training, and variable compensation. They are confident in the knowledge that improvement in the metrics results in improvements to the underlying customer experiences, which are in turn linked to bottom-line outcomes such as churn reduction, lower average cost-to-serve, increased customer lifetime value, etc. Strategic: Customer service/customer care executives are able to use the results to gauge the impact of service experience strategies, staff assignment/allocation, FTE forecasting, training programs, and supervisory effectiveness on bottom-line metrics such as churn, share-of-wallet, overall/transaction satisfaction, and loyalty/lifetime value. Advanis would never be so arrogant as to claim that its performance measurement systems will move the needle on their own. Our clients are the experts in implementation, but we will claim that we can provide individual, as well as aggregate, coaching tools; near real-time feedback mechanisms for customer "save" programs; easy-to-interpret online tools (your managers won't need a degree in advanced math to interpret); and the cost-effective volumes of data you need to have confidence that the changes you're seeing are real. Advanis' reporting helps our store managers to monitor key metrics on a daily basis. The reports are easy to use and allow each user to understand the strengths and improvement opportunities for their area of responsibility. Learn more about on online reporting dashboards here, or by looking at recent public work we have published.